Facial hair is a prominent issue for many women. Who doesn’t love to have gorgeous and hair free facial skin? Being a woman, I understand this problem pretty well. Hair on facial skin can be a reason behind hormonal changes, polycystic ovary syndrome or hereditary. During my research online, I was surprised to know that over 73% women face this problem and depend on various hair removal techniques that include threading, plucking, waxing, bleaching, creams, laser treatments and epilators. These methods are effective however with their own side effects like skin irritation, redness, swelling, skin discoloration and others. Yet, we always have home remedies to our rescue for almost any problem including facial hair removal. The solution is hidden in your kitchen cabinet. It’s none other than “Turmeric”. Using turmeric, one can happily get rid of facial hair but don’t expect the results overnight. Upon regular application, it can be a sure shot formula to reduce facial hair. Does Turmeric really Remove Facial Hair? When turmeric is applied to the skin, the stickiness will grab the skin tightly. When we scrub, the mixture holds the hair and removes it from the roots. The properties of turmeric will discourage the hair growth thus gradually on regular application, you can get rid of hair completely. 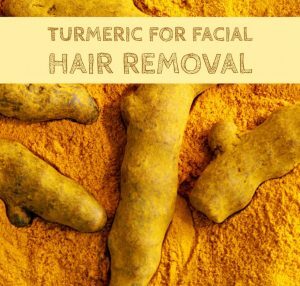 Here are few home remedies using turmeric for facial hair removal. Try all the methods and find the best one that works for you. Mix 2 tablespoons of turmeric with enough water to make a paste. Apply this paste on clean face. After it completely dries, remove it by using a cloth dipped in warm water. For added benefits, use rose water or milk instead of water. This combination helps to dissolve hair and reduce the thickness of the hair. Mix 3 tablespoons of salt in 1/2 cup of water. In a bowl, add 5 to 6 teaspoons of cold milk, 3 teaspoons of turmeric powder and salt solution. Stir well and apply the mixture on unwanted facial hair. Gently massage the mixture for 5 to 10 minutes. Let it dry for few minutes and wash with warm water. Alternatively, you can replace table salt with sea salt. Repeat this process daily to get rid of facial hair. Boil 1/2 cup of sugar with 1 cup of water till it forms sticky sugar syrup. Let the sugar syrup cool down and add 2 teaspoons each of lemon juice and turmeric to it. Stir well to make a thick paste and apply in the direction of hair growth. Rinse it off with water or use a damp cloth and rub in the opposite direction. Or you can exclude sugar and follow the same process. Repeat this process 2 – 3 times a week to achieve quick results. Mix equal quantities of turmeric, gram flour and water to make a thick paste. Apply a thick layer of the mixture on facial hair. Let it dry completely and rinse with a cloth dipped in warm water. Use this method 2 – 3 times a week. Raw papaya contains an enzyme called papain which restricts the growth of hair by breaking down the hair follicles and turmeric helps in removing the hair. Peel, chop and blend papaya. Combine 2 tablespoons of papaya paste and 1/2 teaspoon of turmeric powder. Apply this mixture on facial hair and let it rest for 15 – 20 minutes. Follow this process 2 times a week. In this combination when the papaya and turmeric reduce the hair growth, the aloe vera and oils will nourish and moisturize the skin. Mix 1/4 teaspoon turmeric, 3 tablespoons aloe vera gel, 1 tablespoon papaya paste, 1 tablespoon mustard oil, 1/4 tablespoon chickpea flour and 2 drops essential oils of your choice. Stir well to make a fine paste and apply this mixture over the face in opposite direction of hair growth. Let the paste dry for 15 – 20 minutes. It takes about 3 months to remove the unwanted hair completely if followed regularly for 3 – 4 times a week. Mix 1 teaspoon turmeric powder, 1/2 cup chickpea flour, 1 teaspoon fresh cream and 1/2 cup milk. Stir well and apply this mixture over the face. Let the paste dry for 20 – 30 minutes. Wet your hands and gently scrub in the opposite direction of hair. Alternatively, use lemon juice instead of fresh cream. In this combination, potato bleaches (whitens) the hair and lentils, turmeric helps to pull the facial hair. Soak 1 cup of yellow lentil in water for overnight and grind it to make a paste in the morning. Grate 1 potato and extract juice from it. Mix yellow lentil paste, potato juice along with 1 teaspoon each of turmeric and honey. Stir well to make a thick paste and apply on clean face. Let it dry for 15 – 20 minutes, and scrub off in the opposite direction of the hair growth. In this process, Indian nettle gently penetrates in to the skin and gradually reduces the hair thickness and turmeric helps to pull off the hair slowly. Wash the Indian nettle leaves and crush to make paste. Grind fresh turmeric root to make a paste. Mix 1 teaspoon of turmeric paste and 3 tablespoons of Indian nettle paste. Mix well and apply on clean face. Let it rest for couple of hours and rinse it off with water. Following the process everyday for 4 – 6 weeks helps to get rid of facial hair. Note: You can also apply this paste before going to bed and rinse off in the morning. Combine 1/4 teaspoon of turmeric, 1 tablespoon each of wheat bran, gram flour and curd. Mix well and apply this paste on unwanted facial hair. After 20 – 25 minutes, wet your fingers and gently scrub the mixture in circular motions. After continuously scrubbing for 3 – 4 minutes, rinse it off. Follow regularly for 2 – 3 times a week. Mix 1 tablespoon black gram flour, 1 teaspoon yogurt and pinch of turmeric. Stir well to make a fine paste and apply on clean face. Let it dry completely and scrub off the paste with damp fingers. Make a paste by combining whole wheat flour, turmeric and sesame oil. Apply this paste on unwanted facial hair. Leave it for 30 minutes and scrub it off with fingers. Alternatively use coconut oil instead of sesame oil. Soak few almonds for 4 – 5 hours and grind them to make a paste. Combine almond paste, turmeric and few drops of rose water to make a thick paste. Apply this paste on clean face and let it rest overnight. Combine 2 tablespoons barley flour, 1 teaspoon turmeric and some water to make a thick paste. After 10 – 15 minutes, gently scrub the mixture in circular motion. Separate egg white of 1 egg. Whip egg white and 1/2 teaspoon turmeric. Apply this on clean face and leave on till dries. Gently peel it off and pat dry. For added benefits add corn flour to the mixture. Make sure to repeat the procedure 2 – 3 times a week. Mix 2 tablespoons rice flour, 1 teaspoon turmeric and 3 tablespoons sour cream. Stir well and apply this on clean face. Let it rest for 10 – 15 minutes and gently scrub off the mixture. If you have dense thick hair then this combination works wonders in removing them. Mix oatmeal powder, turmeric and milk cream. Apply this mixture on clean face and let it rest for 10 – 15 minutes. Scrub off the mixture using your finger and rinse off with water. Make sure you wear old clothes to avoid turmeric stains. Turmeric usually doesn’t stain the skin but if it does, simply dip cotton ball in milk or almond oil to and remove the satins. Kasturi manjal turmeric is known to be pure and good for home remedies. Avoid using turmeric if you allergic to it. Always perform a patch test before applying any pack or mask. If you observe any negative results stop using. Have a steam bath before applying any pack to open up the pores. If you have tried any home remedy for facial hair removal apart from the above, please do share it with us in the comments section below. Hello is it normal to feel a burning sensation when using turmeric on the face? I tried the turmeric with gram flour and it really stings. Do u use fresh turmeric or powdered? You can any one of them as per the availability. Will this work for teens who want to get rid of facial hair? Yes, it works. Try and share your experience. It is difficult to tell the exact time as everyone’s hair growth and texture is different. Once the turmeric application dries, you have to rub it on the opposite direction of hair growth. As turmeric sticks to the skin, this friction will remove the hair from the roots. If you have been doing the same then have some patience as this process takes time to show the results. Yellow termanic or normal termenic………other person tell me yellow termenic with suger and allovera gel …….7 application in 15 days alternate days…….is it possible ? Yellow turmeric is the better option. If you have thin hair, then it may be possible to remove them in 15 days. I heard that the skin gets black/darker when exposed to sunlight after application of turmeric. Is it true? Are these processes able to remove facial hair if you have been shaving for a long time ? Nope. They help to remove fine hair. However, it can discourage the hair growth gradually. Hi, I wish to use this method for body, instead of facial hair. Will it work in your opinion? Also do I need to wax first? From some of your comments I surmise this is not just a mask but a hair removal system. Have you seen anyone using this method who got rid of unwanted hair forever? Thank you. For body hair removal, try any method mentioned in this article – http://homeremediesforlife.com/unwanted-hair-removal/. You don’t have to wax before starting the treatments. The methods helps to remove the hair however they don’t prevent the growth of new hair. They also help to reduce the growth frequency of new hair. Does it remove the hair completely, and how long does it take to see results? Yes, turmeric application sticks to your skin and when you rub it against the hair growth it removes the hair from the roots. Fine hair may take less time to remove but thick hair can take a long time. Can kasturi manjal and coconut oil be used after threading the facial hair for preventing the growth / comeback of hairs again ?? Yes, you can. The combination helps to discourage the hair growth. İ have thin hair can i apply any of the paste daily ? Turmeric usually doesn’t cause skin discoloration. Yes, you can apply turmeric paste daily. Can you mix enough of the turmeric and papaya to last more than one application ? If so how long will it keep and remain effective?